Big news today! We’re launching several new Microsoft® Office 365® solution offerings. Designed to take the end-user experience to the next level, our solutions enhance Office 365 with integrated backup, continuity, cloud voice, compliance and security services. Further, these solutions include our J.D. Power certified support, and Worry-Free migration, as additional value-adds. Additional services from our one-stop shop of 30+ cloud business applications are available as add-ons to any Office 365 solution offering. You can learn more by reading our press release. Partner profitability opportunities are limited by purely selling Office 365 without additional value-added services. By incorporating Intermedia services such as cloud voice, backup and continuity, as well as migration and technical support with Office 365, partners build a foundation that enables them to bring exceptional value to their customers and profitability to their business. In addition to helping the channel differentiate from other vendors, selling complementary products alongside Office 365 increases profitability, as indicated by 73% of the channel, according to The Buyer Persona Institute. Intermedia gives partners the marketing resources, support, and additional white-labeled products to help them add value to Office 365 and increase margins, while still owning the customer relationship. 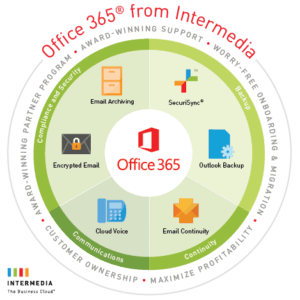 If you’re not already an Intermedia partner, these new Office 365 solution offerings are a great way to get started. You can learn more about Intermedia’s Private Label model on our website. Intermedia provides the channel community with a significant advantage when selling Office 365 – the ability to put add-on solutions in their own name. It doesn’t get much better for partners than the ability to deliver Intermedia’s solutions and award-winning support, with their own brand at the center of it all. Have questions? Want help getting started selling these new Office 365 solutions? Head over to the Partner Sales Portal to find information and tools to make selling a success. And if you have any questions, feel free to call 888-299-2522. HostPilot, Office in the Cloud, and SecuriSync, are either registered trademarks or trademarks of Intermedia.net, Inc. in the United States and/or other countries. Microsoft, Office 365, and Outlook are either a registered trademarks or trademarks of Microsoft Corporation in the United States and/or other countries. J.D. Power 2016 Certified Assisted Technical Support Program, developed in conjunction with TSIA. Based on successful completion of an audit and exceeding a customer satisfaction benchmark for assisted support operations. For more information, visit www.jdpower.com or www.tsia.com.